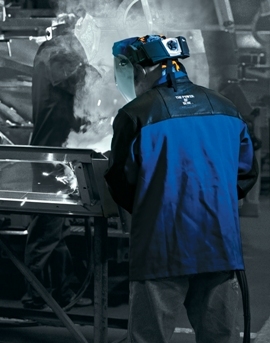 What’s the best welding safety apparel? The best apparel for welding is made of flame resistant material–but we also know that you want to look good on the job as well. 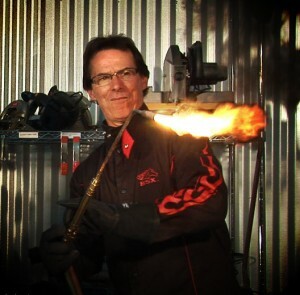 One of our favorite lines of welding safety apparel is the BSX Xtreme Welding gear tricked out with some awesome flame action on the sleeves (Pictured left: check me out in the Ultimate Weld Shop). We also offer the more classic lines of flame resistant wear from Miller and Revco— top quality flame resistant fabric and leathers in classic styles. We also like the Angelfire line of welding safety wear from Revco for women welders. In the picture below our own Joanie Butler is rockin’ the Angelfire welding jacket (sized and cut to fit a woman’s body). How do I protect myself from heat stress? Even though winter approaches and the first reports of snow have started coming in, we all know summer will be back (we hope). With summer comes a higher risk of heat stroke and heat exhaustion—and that’s serious business! 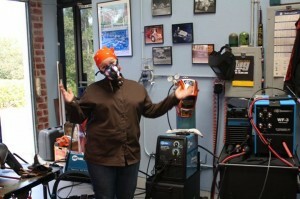 (For more info on welding during the summer, read “Welding Safety: Protect Yourself from Summer Heat” ) In addition to finding shade and staying hydrated, you may want to check out the Miller CoolBelt™ and CoolBand™ systems which integrate with your welding helmet (so you can weld with a cool head!). How do I protect myself from welding fumes? In recent years protecting welders from fumes has been a big part of welding safety, from ensuring that your shop is well ventilated, to the development of personal protection welding equipment for respiratory health. Again, Miller has been a leader in offering top quality personal protection gear like the Powered Air Purifying Respirator system that fits under your hood, Our own Joanie Butler (also an Arc-Zone PRO Partner) especially likes the Half Mask respirator. What about welding gloves? How do I know which size gloves to order? The gloves you need will depend on the type of welding you’ll be doing. For TIG Welding some folks like the ultimate flexibility of a deerskin glove, but a good general purpose welding glove could be made of goatskin, a more durable glove from cowhide. Whatever your preference, Arc-Zone carries a variety of classic gloves from Miller and some edgy stylin’ gloves from Revco’s BSX line, and even Angelfire welding gloves for women welders. And you can make sure you get the right size with our welding glove size chart! And remember, Arc-Zone has a No Hassle Return Policy. Thanks for the good information on welding safety. I feel that the importance of the proper safety equipment cannot be overstated. I’ve seen a friend who didn’t utilize good safety measures, and things got ugly. There’s no reason to take chances with your health and life. An ounce of prevention, they say, is better than a pound of cure. I’m glad that you suggested picking gloves based off of the type of welding you will be doing. I have been wanting to learn how to weld for a while, and now I’ll finally be able to try it. I can see how it might be good for me to go with a really durable glove, and work my way down as I get better at it.